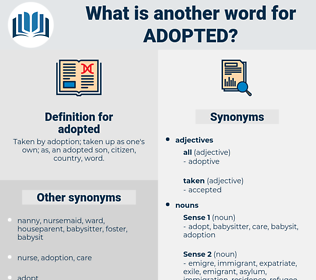 What is another word for adopted? 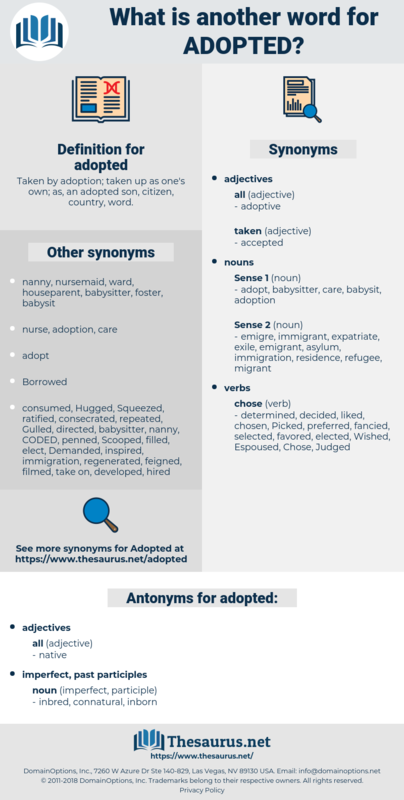 approved, payments, adopts, adoption, adoptions, CERS, takes, Has. adoptees, enactments, outcomes, Regulations, mandates, approaches, stages, responses, nations, arrests, orders, decrees, charters, adopts, adoptions. approving, opted, accepted, utilize, recommendation, Adhered, admitted, demonstrated, appointed, Embraced, acknowledged, methodologies, Upheld, proposed, Policies, stopped, supported, Undertook, Undertaken, resolutions, addressed, withheld, Ceased, methodology, reproduced, appropriated, reported, imposed, Drafted, ratified, initiated, hailed, Followed, appreciated, dependence, practice, practices, authorities, declared, reaffirmed, recognised, added, practised, repeated, considered, proceed, Proceeded, conduct, conducted, allocated, rejected, Acceded, Applauded, concluded, amended, apprehended, opposed, authorised, recognized, sustained, collected, Approached, Espoused, broadcast, Submitted, prepared, confirmed, utilized, finalized, applied, validated, method, contained, amendment, conceded, Stipulated, Deposited, engaged, Detained, Existed, Captured, determined, Condoned, retained, Switched, imported, discovered, Delivered, acquired, Embarked, strategy, suitable, presented, Performed, identified, observed, held, Favoured, drew, Did, Attracted, assumed, sponsored, Concurred, Borrowed, selected, follow-up, Rendered, increased, no., ended, pronounced, Resorted, expressed, spent, Depended, retired, affirmed, Instituted, course, confessed, left, Chose, Heeded, continued, Came, Measures, received, Allowed, joined, granted, halted, Created, Achieved, included, elected, decision-making, scientific, welcomed, resolved, changed, Emerged, Picked, registered, Listened, Suffered, Stayed, Assented, Exhibited, anticipated, Consigned, Relating, Voted, Enabled, sat, saved, learned, fulfilled, placed, ascertained, Relied, Worked, expected, Earmarked, noted, Entered, Became, deducted, Was, Were, elaborated, noticed, planned, concerning, built, seized, equipped, shared, Launched, faced, led, sent, moved, arrest, Arrived, fixed, motion, read, tabled, found, required, affected, Awarded, Levied, finished, filled, cast, Offered, HIT, Gained, needed, shut, Began, Resumed, members, states, Returned, struck, Brought, Resulted, mounted, Reached, Had, raised, kept, rose, called, busted, stated, Gave, Claimed, signed, Went, pulled, Looked, saw, Acted, base, based, rev., Met, date, approved, thought, civil, 2001, cut, Got, proclaimed, developed. opted, accepted, operationalized, Administered, Adhered, admitted, Advocated, updated, demonstrated, appointed, adoped, Accommodated, adjusted, Embraced, acknowledged, Participated, Tolerated, discontinued, Upheld, proposed, coordinated, transposed, preferred, rapporteur, stopped, supported, withdrawn, integrated, Undertaken, Standards, designated, resolutions, recommended, representative, formalized, addressed, withheld, Ceased, Negotiated, reproduced, postponed, appropriated, reported, formulated, imposed, Drafted, procedure, ratified, mainstreamed, devoted, initiated, Deployed, strategies, Followed, declared, employed, expanded, recognised, added, Replicated, practised, terminated, repeated, organised, regulated, considered, proceed, D, sanctioned, attempted, interpreted, prescribed, solidarity, Operated, conducted, allocated, rejected, Acceded, directive, attended, Guidelines, concluded, amended, Complied, Constructed, apprehended, opposed, authorised, recognized, sustained, strengthened, collected, Promoted, accompanied, Espoused, dictated, principles, Consented, maintained, Displayed, broadcast, Submitted, Indicated, prepared, organized, understood, confirmed, utilized, Responded, Transferred, persecuted, enforced, trapped, finalized, Effectuated, advanced, applied, penalized, Devised, subscribed, imprisoned, removed, validated, method, contained, amendment, described, governed, standard, mechanisms, represented, engaged, Detained, Existed, recaptured, Captured, determined, inspection, retained, Switched, tailored, imported, completed, humanitarian, discovered, modified, Delivered, revised, acquired, government, legislative, Migrated, outlined, Embarked, presented, Inaugurated, penalised, Performed, identified, Succeeded, drawn, observed, perceived, favourable, improved, held, Favoured, mandated, embodied, Discussed, settled, supposed, deputized, Attracted, assumed, sponsored, inherited, Borrowed, accomplished, structured, selected, Tackled, Rendered, increased, Borne, cancelled, ended, Defended, occupied, assigned, announced, pronounced, Resorted, expressed, euro, written, monitored, Managed, recorded, proved, proven, Inserted, permitted, attached, transmitted, spent, Evolved, reflected, Depended, treated, retired, extended, Instituted, chosen, recovered, Notified, fostered, Recruited, Modelled, played, conference, Exercised, detected, estimated, statement, continued, Invoked, received, Enshrined, embedded, Negatived, Allowed, vote, voting, joined, Exerted, granted, intended, halted, Created, started, owned, Achieved, included, ministers, elected, renewed, satisfied, Accorded, imagined, regained, welcomed, resolved, zero, changed, Emerged, Picked, registered, related, Suffered, recourse, Assented, november, pleased, contracted, handed, Exhibited, informed, turned, anticipated, posed, punished, Learnt, Consigned, Voted, specified, inscribed, Exported, Enabled, endowed, learned, become, printed, placed, ascertained, mobilised, Relied, staffed, Worked, expected, noted, Entered, reviewed, deducted, foreseen, involved, concerned, elaborated, austria, Shifted, noticed, covered, planned, built, seized, hired, designed, equipped, shared, witnessed, Referred, Launched, faced, Happened, led, vetted, Shown, Targeted, moved, Subjected, grown, Arrived, fixed, Occurred, Screened, tabled, found, Assessed, required, Emitted, Greeted, verified, affected, scheduled, Coined, Awarded, said, doomed, Incurred, biased, ensured, framed, Aimed, suited, aligned, Sentenced, filled, Begun, projected, cast, sought, HIT, Gained, spelled, Believed, needed, shut, Resumed, Returned, struck, reserved, closed, Brought, Resulted, mounted, ordered, =, have, tested, text, Reached, Asked, Had, risen, tried, driven, raised, fallen, kept, girls, focused, Dealt, called, busted, Remained, Rights, ruled, bull, cleared, heard, given, known, stated, Claimed, linked, listed, dated, gone, seen, -rrb-, formed, signed, Acted, based, Met, requested, approved, thought, 4.1, 2005, Got, 2000, Has, proclaimed, developed. enact, take, approved, endorse, sanction. I know, as well as you do, that Philip has married the adopted child. Last week I met a woman who had adopted a baby boy through Children of Light. adept, adopt, adapted, autophyte, adapid, at-bat, adapt, adoptee.